Free Furniture If Red Sox Win World Series A Boston-area retailer offers to refund the price of any mattress, dining room table, sofa or bed if the Red Sox win the World Series. About 30,000 pieces of furniture were bought during the store's season-opening promotion. 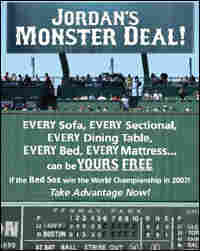 The store took out insurance so it won't lose too big if the Sox go all the way. A Boston-area retailer offered to refund the price of any mattress, dining room table, sofa or bed bought during an April promotion if the Red Sox were to win the World Series. About 30,000 pieces of furniture were bought during the season-opening deal at Jordan's Furniture. The store took out insurance so it won't lose too big if Boston goes all the way. So with the Red Sox and the Colorado Rockies now facing off in the World Series, some of the couch potatoes watching from home are rooting to win the very couches they're sitting on. Nate McKinnon is one of them. The decor in his bedroom says "Red Sox fan." The furniture says "25-year-old bachelor on a budget." With one exception. After years of sleeping on futons and second-hand beds, McKinnon now owns a quality mattress – with a pillow top. "Each of the springs is in its own pocket," McKinnon says. "It makes it supposedly so that you don't disturb your sleep partner. I don't have a sleep partner, but if I did they wouldn't be disturbed." McKinnon paid $508 for the mattress, but if the Red Sox win the fall classic, he'll get the money back. He bought it in April as part of the Jordan's Furniture promotion. On the last possible day, McKinnon bought the mattress. That afternoon, he went to a Red Sox game at Fenway Park. That's where buyer's remorse kicked in. "I felt like a total chump. I'm sitting there, you know, I'm just like: Did I just get suckered into something? And then they lose, and I'm like: Ugh, oh gosh!" McKinnon says. Now the people who feel like chumps are the ones who did not buy during the promotion. Curt Nickisch reports from member station WBUR.